5:53 a.m. – An alarm from a business on Dexter lane was investigated and found to be a false alarm. 8:36 a.m. – A resident came into the police department to speak to an officer regarding a civil issue. 9:28 a.m. – AN officer assisted another agency on Old Dennett Road. 9:44 a.m. – Suspicious activity was reported in the area of US Route One and Ledgewood Drive. 10:27 a.m. – An alarm from a location on Rogers Road was determined to be a false alarm. 4:05 p.m. – A citizen came into the police department to report the theft of a license plate. 4:36 p.m. – An officer dealt with a sick raccoon. 8:00 p.m. – Assistance was provided to another agency. 9:08 p.m. – Officers assisted another agency. 1:18 a.m. – An officer checked on suspicious activity they observed on US Route One. 9:58 a.m. – Suspicious activity was reported on Shapleigh Road. 11:00 a.m. – An individual came into the police department to report fraud. 11:38 a.m. – A motor vehicle accident occurred at the intersection of Government Street and Prince Ave.
1:34 p.m. – Following a report of an assault on US Route One Patrick T. McGann, 57, of 2 Moonlight Drive, Newmarket, NH was arrested for assault. 1:38 p.m. – An officer responded to Ledgewood Drive for a report of an unwanted subject. 11:05 p.m. – An officer initiated a traffic stop on the US Route One Bypass. 2:18 a.m. – The area of the I-95 Freeway was checked for a vehicle. 9:25 a.m. – A resident came into the police department to report identity theft. 2:53 p.m. – A report was received of suspicious activity on Goodwin Road. 3:09 p.m. – A burglary was investigated on Love Lane. 3:30 p.m. – A citizen came into the police department to report a lost wallet. 7:08 p.m. – A motor vehicle accident involving two vehicles occurred on State Road. 9:48 p.m. – Another agency was assisted. 1:40 a.m. – An alarm from a business on US Route One was investigated and found to be a false alarm. 2:39 a.m. – An officer initiated a traffic stop on Route 236. 7:08 a.m. – A two vehicle motor vehicle accident occurred on Gorges Road. 10:42 a.m. – An individual came into the police department to turn in a found article. 11:18 a.m. – A hit and run accident occurred on US Route One. 11:51 a.m. – Criminal mischief was reported on Miller Road. 12:57 p.m. – A motor vehicle accident involving two vehicles occurred on Wilson Road. 2:30 p.m. – A two vehicle motor vehicle accident occurred on the US Route One Bypass. 3:45 p.m. – An officer assisted with a motor vehicle accident. 5:06 p.m. – A report of a shoplifter was received from a business on US Route One. 5:25 p.m. – Following a motor vehicle stop on US Route One Jason Ryan Brierley, 22, of 142 Lawrence Street, New Bedford, MA, was summonsed for possession of marijuana. 10:02 p.m. – An officer initiated a traffic stop on US Route One. 1:40 a.m. – An officer assisted another agency on US Route One. 4:06 a.m. – An alarm from allocation on Water Street was investigated and found to be a false alarm. 4:32 a.m. – The area of the I-95 Freeway was checked of a vehicle. 7:52 a.m. – A resident came into the police department to report a vehicle verse deer accident that occurred on Pepperrell Road. 1:27 p.m. – A motor vehicle accident occurred on US Route One. 3:56 p.m. – A motor vehicle accident involving two vehicles occurred on Whipple Road. 6:57 p.m. – An alarm from a business son US Route One was determined to be a false alarm. 7:58 p.m. – Cole Street was checked for a stray white bulldog. The dog was gone upon the officer’s arrival. 8:25 p.m. – The K-9 officer assisted another agency. 12:05 a.m. – An officer initiated a traffic stop on the US Route One Bypass. 8:04 a.m. – An abandoned bicycle was found on Woodlawn Ave.
8:47 a.m. – The animal control officer responded to Foyes Lane for a fox complaint. 10:23 a.m. – A stray dog was reported on Pepperrell Road. The animal control officer took the dog to Creature Comforts. 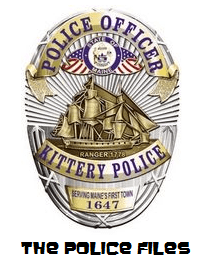 12:10 p.m. – A resident came into the police department to report a cat lost from Picott Road. 1:22 p.m. – A stray cat was found on State Road. 2:43 p.m. – A lost American Express Card was reported. 5:37 p.m. – Officers responded to the area of State Road and walker Street for a report of suspicious activity. 10:05 p.m. – A vehicle went off the roadway at the intersection of Tenney Hill Road and Chauncey Creek Road. 10:38 p.m. – Suspicious activity was reported on Badgers Island. 9:00 a.m. – An officer assisted the fire department on US Route One. 9:35 a.m. – A citizen came into the police department to report a fraud. 1:33 p.m. – An injured dog was reported on Boush Street. 2:00 p.m. – Charles Alexander Naimie, 27, of 1069 State Road, Eliot, was arrested on a warrant. 4:33 p.m. – Suspicious activity was reported on US Route One. 6:10 p.m. – A caller reported an odor of marijuana on Cutts Road. 6:59 p.m. – An officer responded to the area of Bartlett Road and Cranberry Lane for a reported dog at large. The dog was gone upon the officer’s arrival. A LINK TO ALL PAST LOGS. This entry was posted in General Town News on October 18, 2015 by Chuck Denault.